As an Annual Passholder, I think it’s safe to say that I go to Disneyland at least twice a month. My Premium pass has no blackout dates, loads of discounts and free parking for every visit…all for the hefty price of $669. There are only two Disney theme parks in the U.S., and luckily for Southern California, we have one in our own backyard. 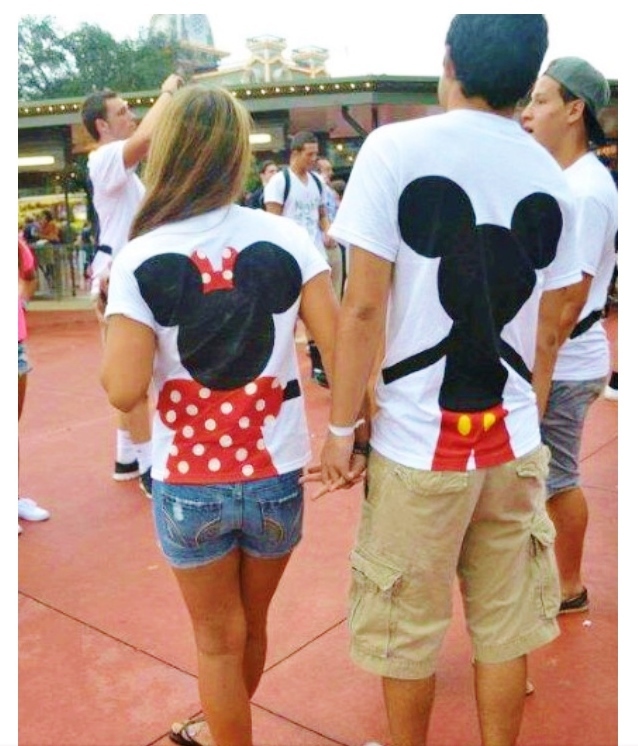 This is probably the most easily spotted type of person at Disney. With a packed-to-the-max backpack, tennis shoes and park map in hand, the classic tourist is hard to miss. They photograph everything, ride everything, meet every Disney character and usually bring a lunch so they won’t have to spend a ridiculous amount of money on park food. It’s usually best to avoid them unless you want to be bombarded with “fun facts” and persuaded into taking a billion castle pictures. 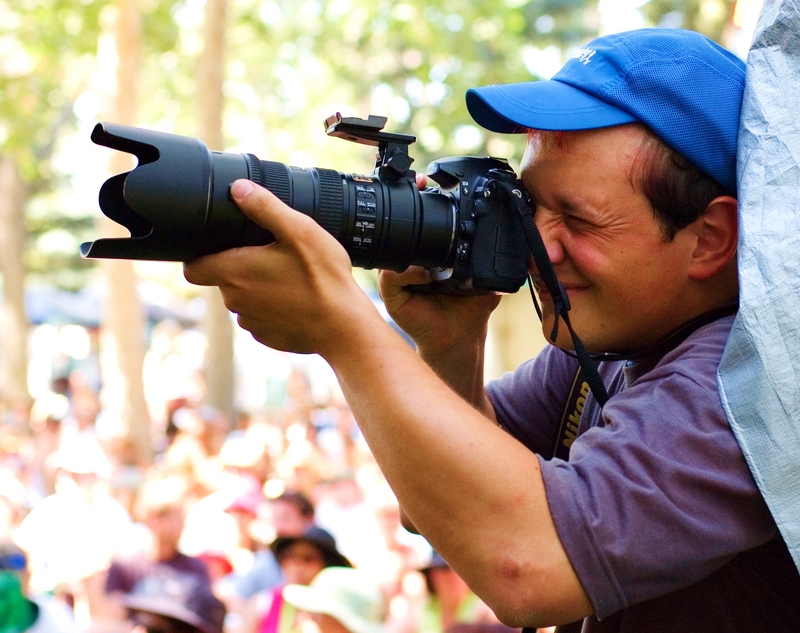 Never to be seen without their giant camera and lens, the photographer never misses a picture opportunity. Every leaf, rock and meal must be photographed; otherwise, how else will they remember that special day they spent at Disneyland?? Helpful tip: Don’t try to photobomb their pictures…they won’t like it and they’ll probably yell at you. Spotted this gem a couple months ago in front of Indiana Jones. 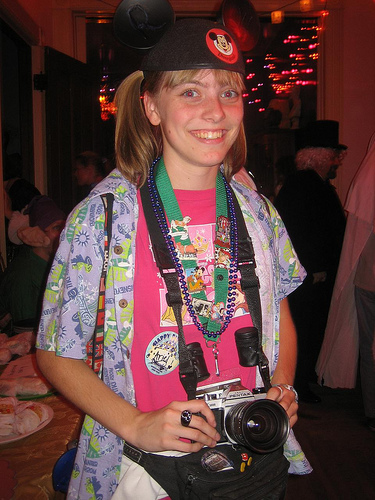 Possibly the most dangerous of all the people you will see at Disneyland. These people have either rented or brought their own electric scooter to ride around in all day while also zooming over people’s toes. While they can be ruthless at times, it’s actually a pretty good idea when you think about it; I’d much rather sit in a scooter all day and honk at people to get out of my way than to walk all the way from Splash Mountain to California Screamin’. Also known as the “first-timers”. 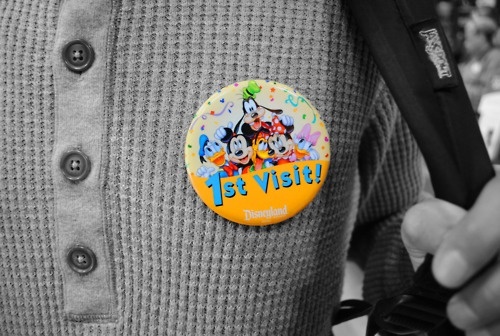 These people are easily spotted by the “First Visit” buttons they’ll be sporting. 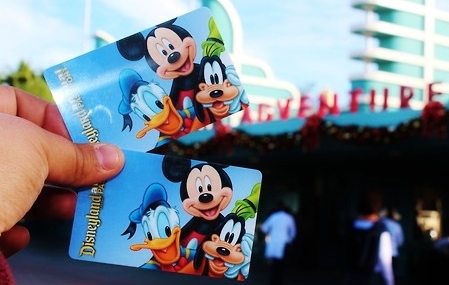 They often wander around Disneyland with an overwhelmed, confused look on their face and a park map in their hand. Many of these people (I assume/hope are from out of state or a different country) see Disneyland as a full vacation so they have lots of days to take in all that Disneyland has to offer. These are the worst! 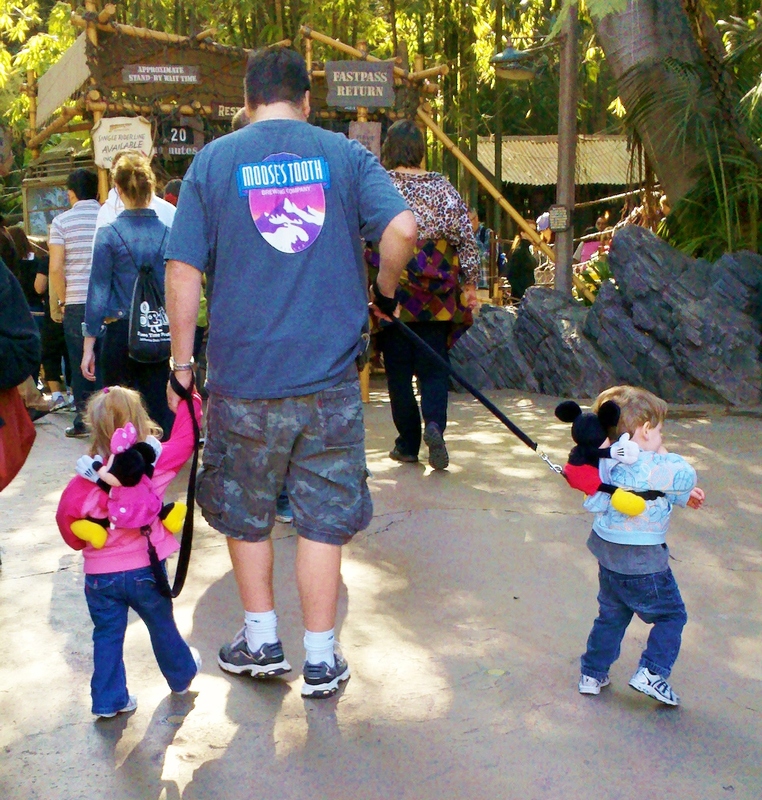 Whether it be a “He’s my Mickey, She’s my Minnie” matching sweatshirt combo or matching ears, they are togeth all day. I wouldn’t recommend getting stuck behind these people in line either. Unless of course you like watching people make out for 45 minutes…uhhhh. While Disneyland is a great date, please save everyone the trouble of watching your PDA throughout the park. There are children here, geez guys. 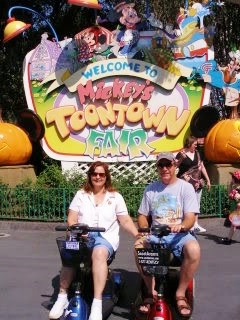 However magical Disneyland is, some people may not think that it’s the Happiest Place on Earth. While there can be crowds, expensive food and screaming children, Disneyland’s atmosphere is always cheery. But these people just want to get the heck out of there. They are not impressed by all that Disneyland has to offer (like Grumpy Cat), which makes me feel bad for them. If you’re going to spend hours there, at least try to be like Mickey. 3 hour wait times? Noooo thank you! 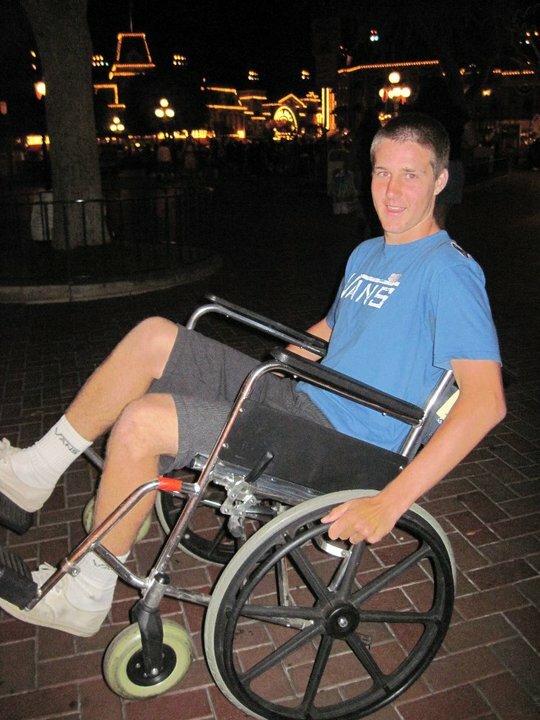 While Disneyland has recently cracked down on their disability rules, people continue to abuse the system. Have a broken wrist and want a wheelchair? This could save you literally hours in line! With the stricter rules lately, I have noticed less people with wheelchairs cutting lines. However, this is an awesome service for those who are truly disabled and need assistance. Just another way Disney tries to accommodate each and every one of their guests. With annual passes, it’s much easier to go to the park for only a couple hours and simply leave as soon as the crowds get too bad. They know where all the Hidden Mickeys are, when the time is best to get on each ride, they are excellent at navigating the park and (on a good day) never wait more than 15 minutes in line. It takes a lot of visits to reach this point, but it’s totally worth it. The Disneyland experience can be even better when you know the ins and outs of the park. There’s also a lot of special events that are open only to AP holders, so go buy yours now!